The price of anarchy  is by now a standard measure for quantifying the inefficiency introduced in games due to selfish behavior, and is defined as the ratio between the optimal outcome and the worst Nash equilibrium. 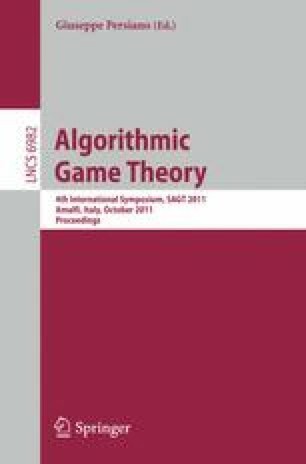 However, this notion is well defined only for games that always possess a Nash equilibrium (NE). We propose the dynamic inefficiency measure, which is roughly defined as the average inefficiency in an infinite best-response dynamic. Both the price of anarchy  and the price of sinking  can be obtained as special cases of the dynamic inefficiency measure. We consider three natural best-response dynamic rules — Random Walk (RW), Round Robin (RR) and Best Improvement (BI) — which are distinguished according to the order in which players apply best-response moves. In order to make the above concrete, we use the proposed measure to study the job scheduling setting introduced in , and in particular the scheduling policy introduced there. While the proposed policy achieves the best possible price of anarchy with respect to a pure NE, the game induced by the proposed policy may admit no pure NE, thus the dynamic inefficiency measure reflects the worst case inefficiency better. We show that the dynamic inefficiency may be arbitrarily higher than the price of anarchy, in any of the three dynamic rules. As the dynamic inefficiency of the RW dynamic coincides with the price of sinking, this result resolves an open question raised in . We further use the proposed measure to study the inefficiency of the Hotelling game and the facility location game. We find that using different dynamic rules may yield diverse inefficiency outcomes; moreover, it seems that no single dynamic rule is superior to another.